My oldest daughter is in first grade, an official Big Kid in school now. I love watching her grow and being involved with her education when I can. This year I have the opportunity to be the Box Tops for Education parent for her classroom and help count, sort and turn in all the Box Tops for her class. It’s a simple job, but when I see the stacks of little rectangles adding up I am reminded what an impact they have. One of the biggest barriers to collecting Box Tops is remembering to cut them off the package and turn them in. I’m sharing how I remember and encourage you to make one of these Box Top collection boxes for your kitchen. Before I get into this tutorial, I should tell you why and how we collect Box Tops. These little rectangles that you can find on participating General Mills products can be redeemed by schools for cash. Cash schools can use to improve classrooms, playgrounds, libraries, whatever they may need. It’s an amazing program that you can participate in, just clip and save Box Tops and turn them into your child’s school. 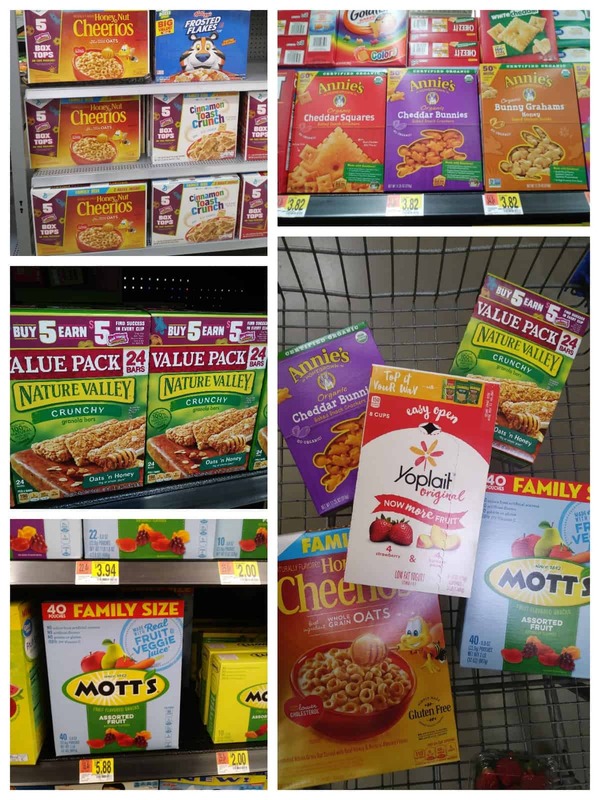 When I shop at Walmart for our weekly groceries I stock my cart with go-to items my family loves that also have Box Tops on them. Some of our favorites are Honey Nut Cheerios™, Yoplait® Original Fridge Pack, Mott’s Medleys® Fruit Snacks, Nature Valley™ Oats N Honey Granola Bars and Annie’s™ Cheddar Bunnies. These items are always in our pantry, but getting into the habit of clipping and collecting Box Tops can be tricky. I have a collection box near my pantry that reminds me to check containers before recycling them. In fact, my container is made from a Nature Valley™ Oats N Honey Granola Bars box. To make this Box Top collection box, start by emptying and enjoying the contents. 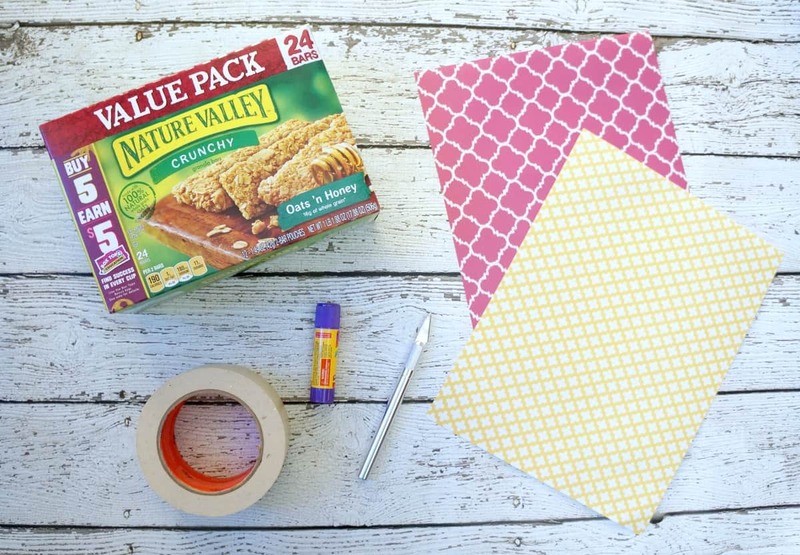 Don’t forget to clip the Box Top before starting this project! Tape the box closed and cut an opening in the top. 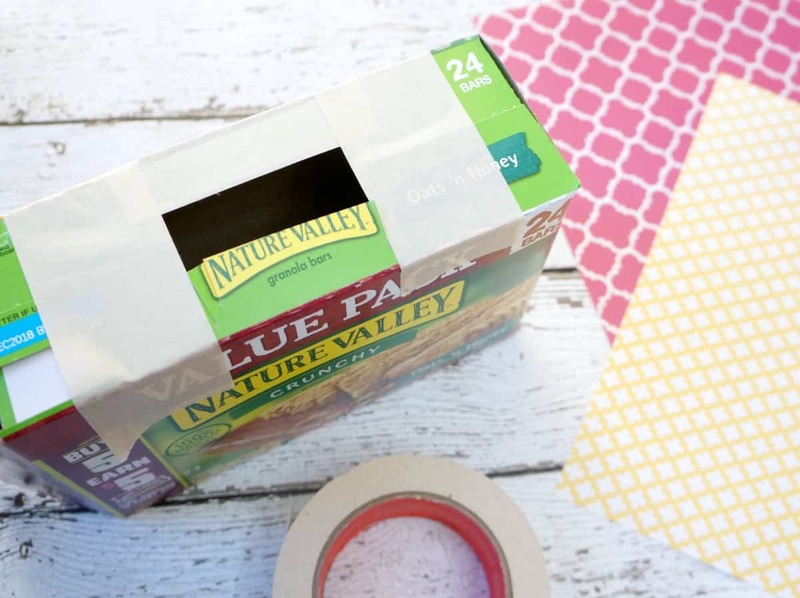 Cut pieces of eye catching paper to fit the top and sides of the box and glue them in place. 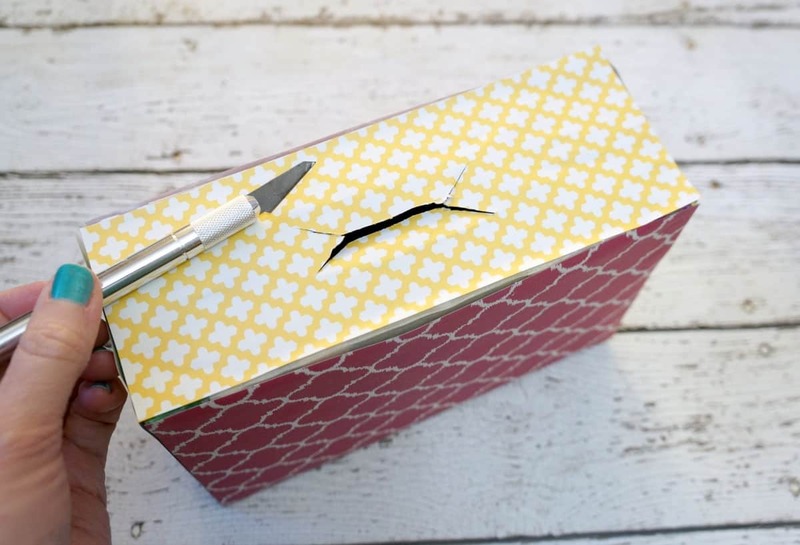 Use the craft knife to cut a hole in the paper over the box opening and secure the paper around the edges. Add a label to the front of the box and write down any instructions from your school. Just place this box somewhere you and your family will see it and start collecting those Box Tops. Want to earn even more? Check out this offer. Download the easy and free Box Tops Bonus App for iTunes or Google Play. This new app helps you turn everyday receipts into cash for your school. You can earn Box Tops in the app in combination with on-package Box Tops too. Right now you can buy 5 participating items, scan your receipt with the Box Tops Bonus App and earn $5 (50 Bonus Box Tops). Offer available through 1/31/18. 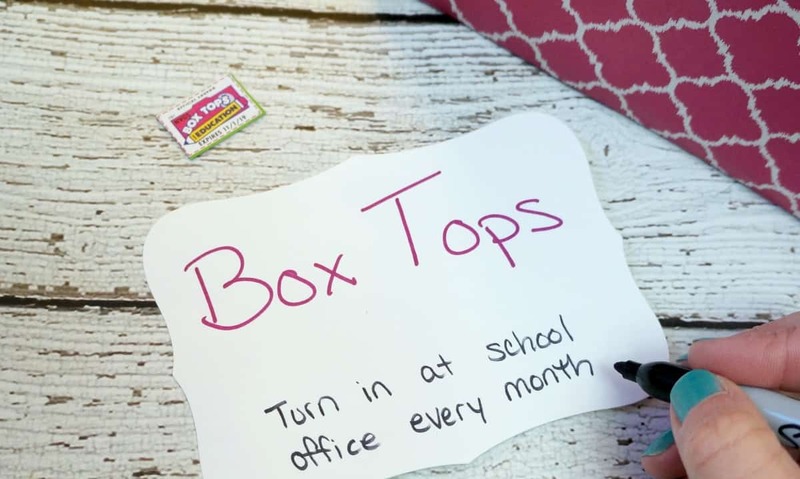 Do you collect Box Tops for your child’s school? What’s your method for remembering to clip them? 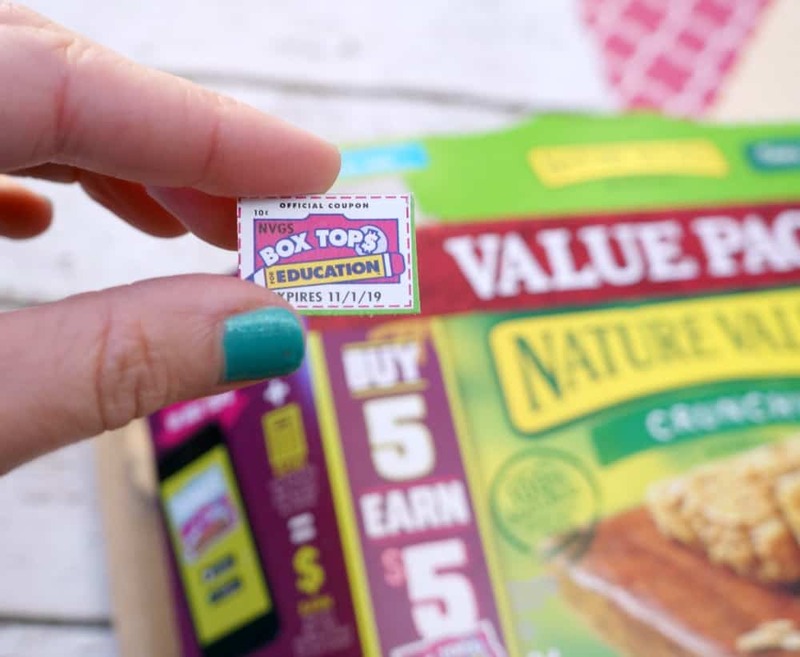 You can learn more about the program here and I encourage you to download the Box Tops Bonus App to earn even more for your school. This is so smart! My oldest is in 2nd grade and collecting box tops right now. In fact, I have two of them randomly on my counter and wasn’t sure what to do with them. 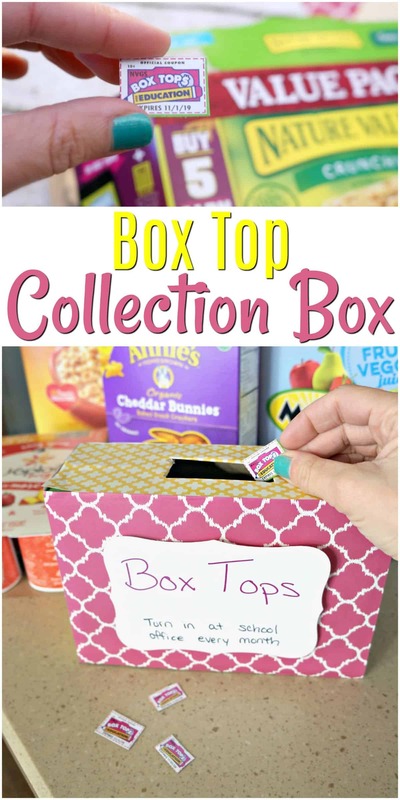 I love this “box for box tops” idea!